Destination weddings are becoming quite popular nowadays and planning the perfect one can be quite stressful. Whether it’s an exotic location with dreamy backdrops or a spiritual one with all them holy vibes, locking down on a destination needs a lot of time and we’re here to help you out a little! Goa is undoubtedly the top hotspot when it comes to planning a destination wedding in India. Caravela Beach Resort Goa on Varca Beach in South Goa offers not only lush surroundings, a serene beach, the sparkling sea and azure skies but also warm hospitality and a Portuguese-style property with suave interiors & expansive outdoor spaces. 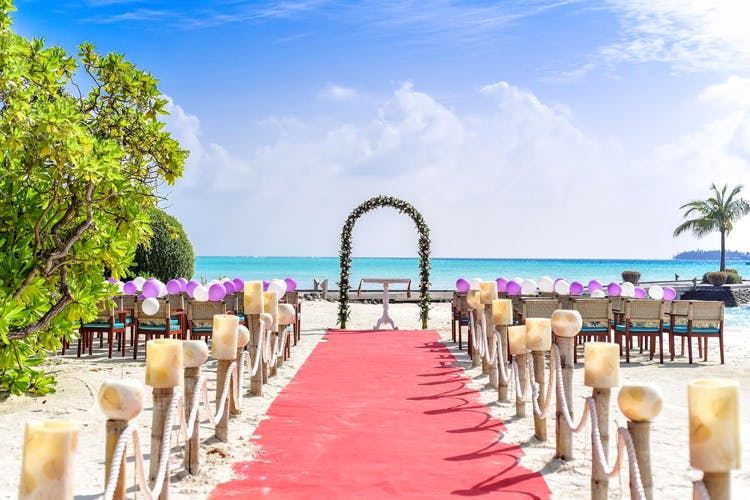 From organising a beach wedding with rose petal-strewn aisles to throwing a pre-wedding party by the beachside, the folks at Caravela promise to give personalised attention to every detail, ensuring an extraordinary experience for you and your guests! Don’t want all the jingbang and want to keep your wedding a simple, yet classy affair? Pick Heritage Village Resort & Spa in Manesar! Popular for elegance and crisp services, this resort has multiple open-air venues to accommodate all your functions and manage everything at a micro level. Spread over 12 acres of scenic surroundings, its location is ideal for a destination wedding closer to Delhi-NCR. Their indoor & outdoor banquet venues are a combination of luxury & elegance, complemented by spacious rooms and a variety of dining options. AND, not to forget, the Rajasthani-style architecture makes for a royal backdrop! Experience their flawless hospitality also at Heritage Village Club, Goa as well. Getting married in Belgaum (Belagavi), a city of beautiful old temples, adds to the sanctity of the ceremony. Scenic surroundings, pleasant climate, an offbeat location and amazing hospitality – Fairfield by Marriott Belagavi promises to deliver all this and much for your special day! As an added bonus, it is in close proximity to the airport and is easily accessible from Goa, Mumbai and Bangalore.